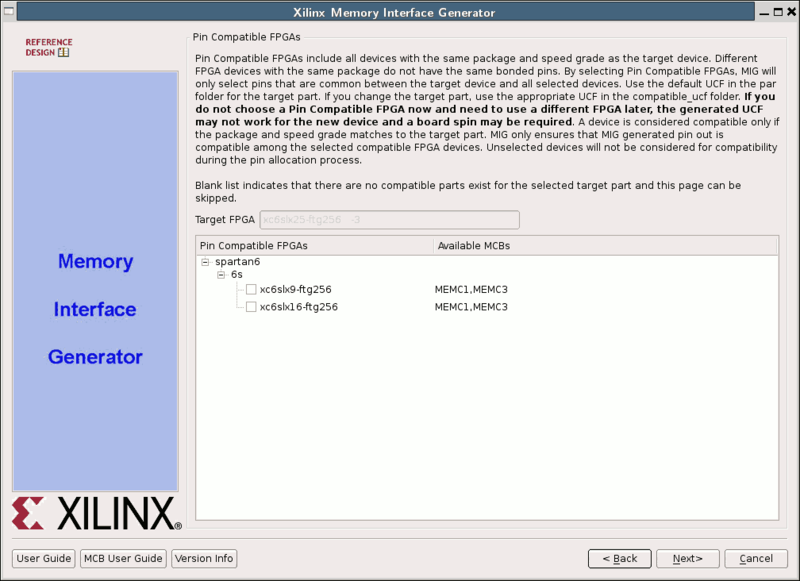 This tutorial explains how the memory controller IP Core is created on USB-FPGA-Modules 1.11. This section describes how the IP Core is created in an ISE project. 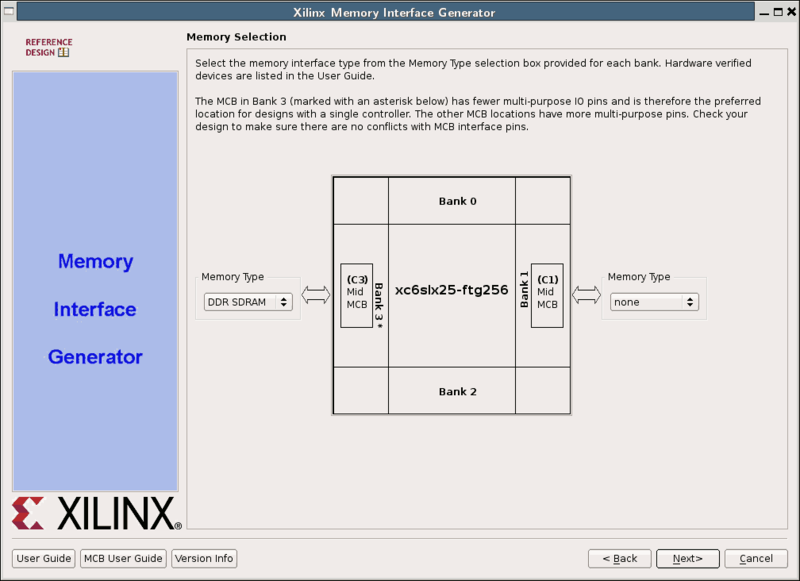 The MIG version used for the screen shots below was MIG 3.5 (of ISE version 12.2). The settings for other versions should be very similar. Click NEXT on the following dialog boxes and Generate on the last screen. 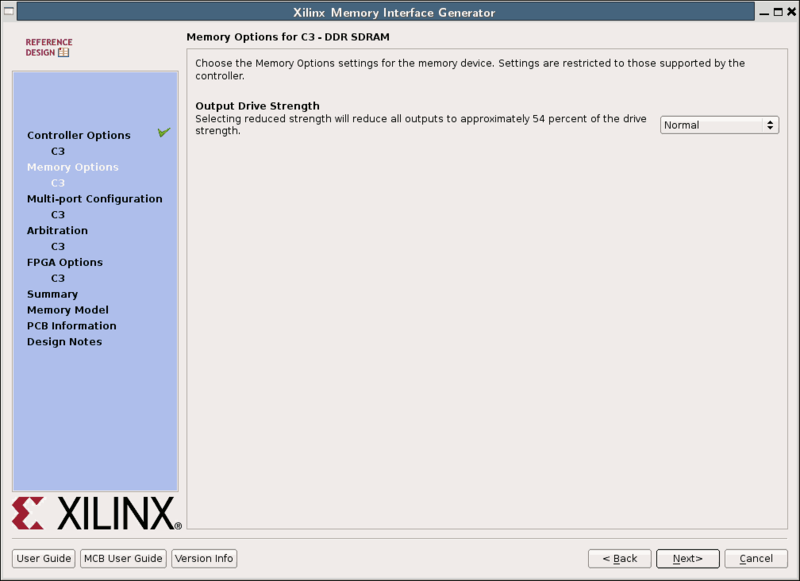 Please use memtest.vhd from the memory test example as reference. Add the component declaration from ipcore_dir/<ipcore name>.vho to the architecture header. The signals CLK, RESET0 and MEM_CLK are defined in the next section. On ZTEX USB-FPGA Modules 1.11 the memory clock is generated from the 48 MHz output clock of the EZ-USB. 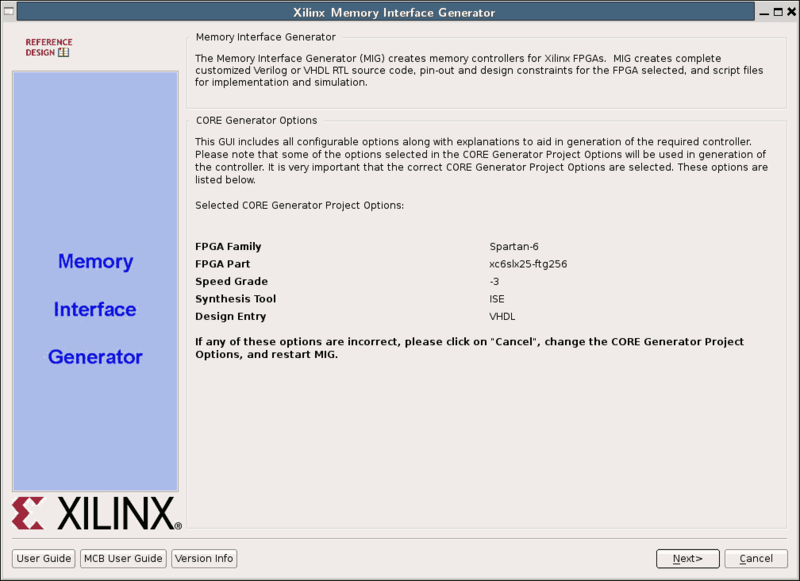 Unfortunately the memory interface generator (MIG) expects that the memory clock comes from an external pin (at least up to version 3.5). The common case that the clock is generated from another clock is ignored by the MIG. 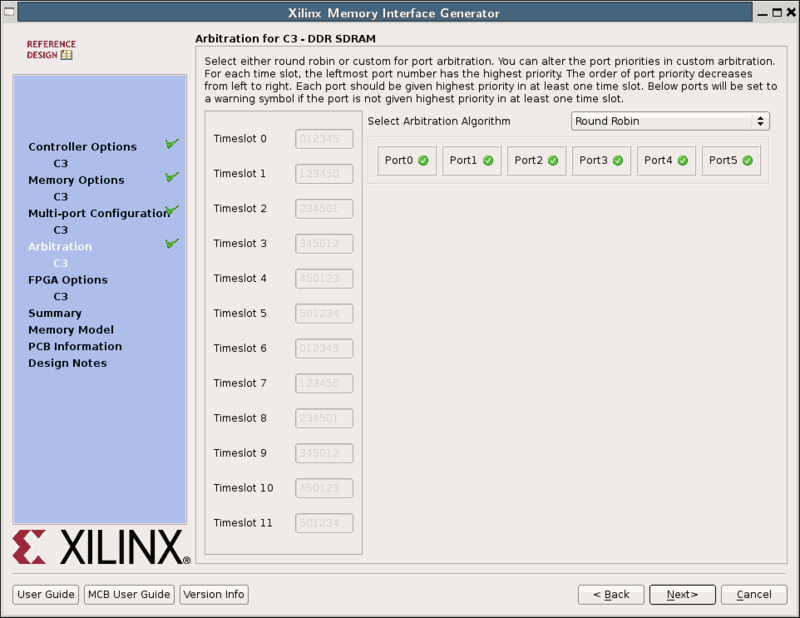 In order to support internal generated clocks a few lines of the memory controller block (MCB) interface generated by the MIG have to be modified. 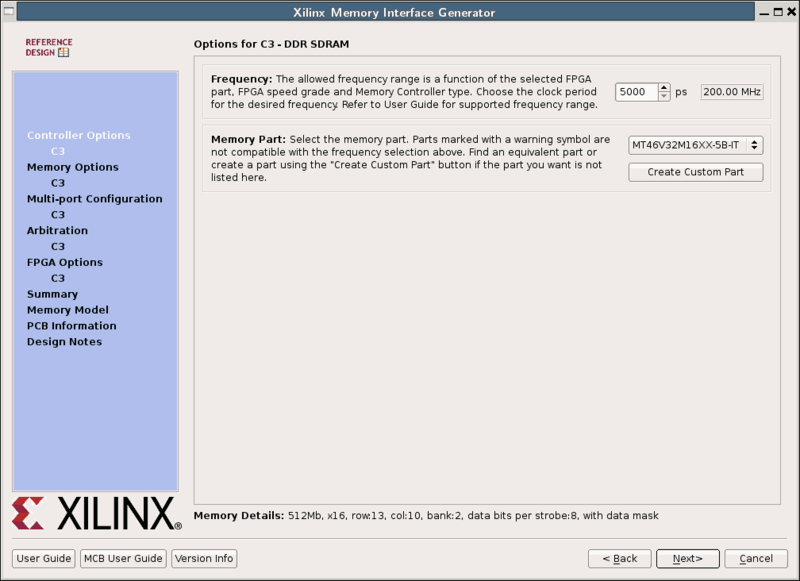 The memory clock is generated by an additional DCM instance. The PLL instance used to generate the internal clocks required by the MCB is modified and the 48 MHz clock is directly used as input clock. This requires no additional clock resources. Both solutions described below defined a system clock CLK. 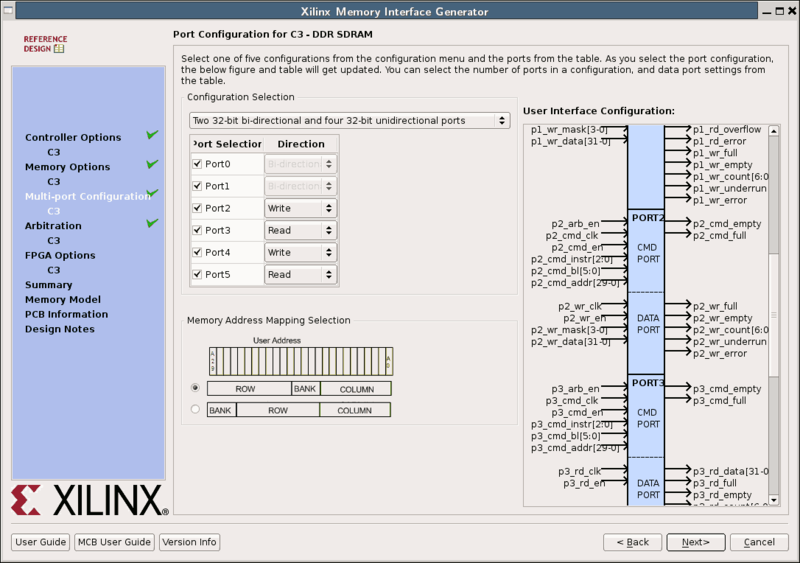 This approach is used in the memtest examples. Apply the changes / patch listed below to to ipcore_dir/<ipcore name>/user_design/rtl/memc3_infrastructure.vhd, i.e. remove all global input buffer (IBUFG) stuff and replace CLKIN1 ⇒ sys_clk_ibufg by CLKIN1 ⇒ sys_clk This allows to connect an internally generated clock to the input of the PLL instance used for the generation of MCB clocks. The .diff file can be found in the memtest example as ipcore_dir/mem0/user_design/rtl/memc3_infrastructure.vhd.diff. It is not possible to generate a 200 MHz clock from 48 MHz within the PLL constraints, i.e. only non-standard clocks can be generated with this method. For this setting the MT46V32M16XX-6 should be chosen instead of the MT46V32M16XX-5B-IT and the clock period should be set to 7500 ps (step 7 in the section “Creating the IP Core”).